A cooker hood is an essential appliance which will help to keep your kitchen smell, steam and smoke free quickly and effectively. 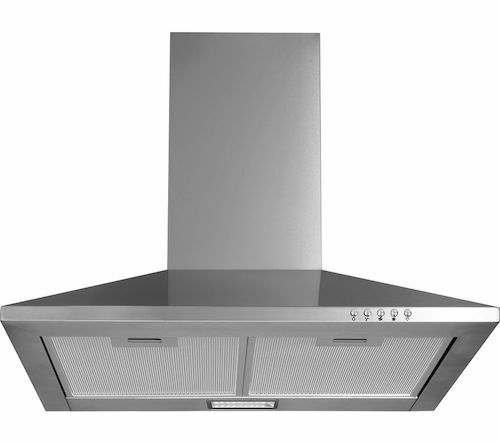 There are several different types of cooker hood available, and depending on your certain requirements, choosing the correct type can be hard. Things to take into consideration include the size of the kitchen, the space in which the hood will fit, the size of your oven or cooker and the noise levels that the hood may produce. Chimney hoods are perhaps the most common form of cooker hood, and will likely be the first design you think of when you hear the words ‘cooker hood’. They are designed just as the name suggests, using a chimney to extract the fumes and take them outside via a pipe. They fit against the wall and go up towards the ceiling, so are not appropriate for your kitchen space if you have storage cupboards above your oven or cooker. This chrome 110cm chimney cooker hood is on the wide side of the scale; perfect if you have an Aga/sizeable cooking area or want a hood which acts as a bit of a statement piece. The immense extraction rate makes it ideal for a large kitchen area, and the three optional speeds mean you are covered for everything from boiling and steaming vegetables to frying steaks and spices. The two 28W halogen lights at the front of the appliance offer a really good level of brightness and more visibility than the LED lights which usually come with modern cooker hoods (although are less energy efficient). The lights just sit behind a really convenient horizontal rail, which is able to withstand the hanging of utensils if desired. Although it is relatively quiet in terms of its specifications, the CLAHDC110BC can get quite noisy on the highest power setting, which is not ideal if you would be easily disturbed by the noise of your extractor. Great for those on a budget, the L60CHDX17 by Logik is smart and easy to operate. The 2.5W LED light at the back of the appliance offers a really bright white glow, which illuminates your cooking space perfectly. The aluminium filter which is included is dishwasher safe, taking the hassle out of keeping it clean every month and means you don’t have to get your hands too dirty to maintain it. With a stainless-steel finish, it is easy to keep polished and looking like new with regular care. It is not very wide, so would ideally suit a small kitchen with a standard four plate hob. The extraction rate is also one of the lowest of those reviewed, so would not be appropriate for a large kitchen which is likely to require persistent and powerful extraction on a regular basis. However, it’s B energy efficiency rating is high for products of its kind. The 3-amp plug required for power supply is included in the price, but the carbon filter and extraction kit are sold separately. The Bosch DWB96DM50B box style chimney cooker hood adds a sleek, modern touch to your kitchen whilst also being incredibly efficient in removing stubborn smells and steam from the surrounding environment. With a 64 dB noise level, the fans will work discreetly without disturbing your mealtime and conversations too much, but without any loss of power. As well as the inbuilt white LED lights, which give perfect clear vision over your hob area and have a life cycle of 40,000 hours, there are also three extraction settings to ensure you have full control over the power required to clear the problem. The intensive setting will clear even the most stubborn of smells and turns off automatically after 10 minutes if left idle. This means you can leave it to its job with peace of mind that you can return to the kitchen in a perfect condition. There is a metal grease filter included in the price, which is essential for ducted and recirculation hoods. Easy to remove, it is easily cleaned and replaced by hand. The extraction kit and carbon filter are sold separately. If you are after something with a high energy efficiency rating to help the planet and cut down on running costs then you can’t get much better than this model, which has a fantastic A+ rating. The second quietest of all the cooker hoods reviewed, the Hotpoint PHVP6.4FALK integrated appliance offers excellent power without any noise disruption to your daily life. If you are after something extra modern and sleek which doesn’t have the typical bulky style of standard flat hoods, then this new generation vertical design is perfect. Integrated hoods are meant to be hidden behind a cupboard door, but this particular one would look attractive as a focal point in any kitchen. The two 20W halogen lights offer a superb amount of light, perfect for even the darkest of areas. The fan and light are button-operated, but choosing the exact power is managed by a digital touch-operated interface, making it incredibly easy to tackle the steam and smoke effects of any dish you are cooking. The display will also notify you of when the time has come to replace your charcoal filter, to ensure you always receive the optimum air filtration efficiency. As a bonus, it is a lot more inexpensive than most other integrated hoods on the market, and a lot better received in reviews. The aluminium grease filter is washable, and although primarily designed to be ducted through an external wall, it can also be operated in circulation mode with the appropriate carbon filter (sold separately). The halogen lights, although bright and relatively inexpensive to maintain, are not as long lasting as LED’s. One of the best chimney cooker hoods in terms of performance, design and price tag - a winner in our opinion. Built-in hoods require a cupboard space to fit inside or underneath. They can come in two broad types – telescopic, which are pulled out and allow you to use the cupboard for storage, and integrated, which often require you to pull the cupboard open to activate the fan. Want an integrated cooker hood that can tackle the hardest of tasks in a large kitchen? Miele has created an appliance which can do just that. The motors have been tested for use for 20 years worth of use, so there is no risk of it underperforming and only lasting you around 5. This includes being on the highest setting frequently, so don’t worry about overdoing it. The stainless steel grease filters are removable for easy cleaning and can be taken care of in the dishwasher, so it makes life easier for you. As long as this is done frequently, your hood should work at maximum capacity for years. You may think that with all of this hard work and high performance, it is going to be a very noisy piece of kit. However, despite the strength of the airflow, it is actually quieter than a lot of smaller, cheaper models. Great if your kitchen is the entertainment hub and you don’t want to be disturbed. Or, maybe you have an open plan home or simply just like a bit of peace and quiet when cooking. It is quite noisy on the highest setting, but this will probably only be a temporary use anyway before being turned down. After ten hours of uninterrupted use, it will switch itself off to save energy. Great if you’re off to bed but the room still hasn’t cleared, or you’re simply a little bit forgetful. The price is a bit steep, but you are paying for a great performance which is essential if you want to keep your kitchen looking and feeling fresh. Plus, if it lasts you as long as it suggests, we’d say you’re actually going to save tonnes of money not buying replacements. Able to keep the air fresh and clean while fitting snuggly into your upper cabinet and out of view, this is a powerful little integrated extractor for smaller kitchens. It installs into the cabinet so doesn’t take up room or space. Also great if you will be bothered about the impact a big bulky cooker hood would have on your style. Just slide the control to the side to turn the fan on, and you can start removing all those pungent smells and smoke. A variable three-speed control will allow you to keep it ticking over to remove steam or work in overdrive to rid the kitchen of the traces of burnt bacon and frying. The metal grease filter is washable which means it won’t just always work very efficiently if you keep it clean, but it can keep the running costs down too as you won’t have to buy replacements all the time. It can work in both recirculation and ducted modes, so no matter your kitchen set up, it can be accommodated. An LED light will illuminate any dark areas of your hob, increasing safety. The price is good compared to some others on the market, and we think it was great for the ease of use, basic yet subtle design and simplicity. Plus, it is cheaper than a lot of the most basic chimney style cooker hoods. Worth consideration if this is your desired hood style. If you are after an integrated model which is simple to look after and will make an impact on your kitchen without being visually imposing, then this model is just over £100 and will keep your kitchen fresh for years to come. Perfect for those who are really short on room, this is a 60cm telescopic, space saving pull-out cooker hood. It can be reduced to its smallest size when not in use, so doesn’t take up unnecessary space or impair the look of your kitchen as it will sit level with the majority of cupboards. Controlled by a slider and with three different extraction rates, the user is given complete control over the operations as well as being able to regulate their energy use. The two metallic grease filters which are included are removed easily and washable by hand with warm, soapy water, reducing the need to replace them regularly which can be an expensive procedure. The product offers two lights in the form of 28W standard bulbs, turned on as well by a slider function, which offer a good amount of brightness but would not be ideal as the only source of light for those who like a bit of a relaxed mealtime ambience. Bulbs are generally big energy absorbers too. The extraction rate is also low compared to larger hoods. Island hoods are for kitchen layouts with an island in the centre of the room, as the name suggests. They are usually large, eye-catching and a lot more expensive than their variants, but this is because they usually have to do a lot more work to clear the larger room as opposed to the other variants. With three different extraction speeds, the Neff I89EH52N0B can clear your kitchen of odours and steam with speed and efficiency, whether you are steaming and boiling or frying and grilling. There is also a handy boost function for those particularly stubborn smells, and the intensive setting automatically reverts after 6 minutes. The circulation options ensure that you can either connect a ventilation hose to an external wall and remove the unwanted air from your kitchen or use charcoal filters to clean and recirculate it back into the room. Designed for ceiling-mounted use, it is suitable for use above either a large hob or range cooker, this product ensures a fresh kitchen no matter on the room limitations and layout. The contemporary, stainless steel and glass finish will fit seamlessly into any modern kitchen and go with any décor and accompanying appliances. This is perfect as it will be a real focal point of your kitchen. The controls are clear and simple, with an easy to see LED display to inform you of the speed setting. If light is a problem in your kitchen, the four integrated LED SoftLight® features will brighten your hob whilst in use and the dimmer function ensures they can be left on to create a really ambient atmosphere. At only 57dB, it is on the discreet side for a product of its size and is the quietest reviewed. The medium extraction rate means it is best suited to a standard-sized kitchen to ensure the full clearance of the air and will also be perfect over a large hob. With an A energy efficiency rating, you can have peace of mind that the hood will work well without affecting your electricity bills. As with the model types, there is a wide variation, but generally they fit into the 60, 70 or 90cm sub-categories. In-built and integrated hoods tend to be smaller as they need to fit both the depth and width of a standard kitchen storage cupboard. Chimney cooker hoods vary in size of the hood, the height of the chimney, and the diameter of the duct you will need. Island hoods tend to be much larger as they will likely be clearing a large area. It is worth bearing in mind the space your hood will fit into, as well as how big your kitchen is and how the size of the product effects the design. These items play an important role in the overall function of your kitchen, so you need to think about whether they will work correctly for your needs as well as how they complement your other appliances. Extraction hoods remove the necessary air from your kitchen and send it outside via a ventilation hose. They need to be mounted to either an external wall or somewhere where the hose can reach outside, so are very reliant on the layout of your room (but most modern kitchens will cater for this). If you can’t vent it externally, a hood that offers air recirculation is your best option. Charcoal filters remove unwanted odours and smoke, before releasing the air back into the room, making them fully flexible. Most modern-day hoods give you both options. This number determines how quickly your hood is able to remove bad air and is given as a rate per hour. The larger your kitchen space, the larger the rate required for fast action. As a recommendation, the rate should be 12x the size of your kitchen – meaning the air can be changed 12 times in an hour to guarantee full purification. This ranges from A+ to G, as with all electrical appliances. The higher the efficiency rating, the better for the environment and the lower the cost to run. As there is a lot for an extraction fan to do, including lighting, they generally rate quite low but plenty of high rated appliances are available. How Often Will I Have To Clean The Cooker Hood? To keep your kitchen grease free, you should ideally clean your grease filter once a month. This also ensures grease does not build up on the filter, which may cause a lack of fresh air and stubborn smell after time. Some filters are dishwasher safe, but the majority aren’t, so if this is something you are conscious about you may have to spend nearer the top end of the price range. The charcoal/carbon filters will also need to be maintained and replaced every so often, so ensure you get to grips with how to do this and look into how expensive they are to replace. Before you buy, ensure this will be achievable. The majority of modern cooker hoods provide extra lighting, but the type differs greatly. LED lights are the most energy efficient and longer lasting, and halogen or bulb lights may need replacing more frequently depending on how much they are used. Think about whether you want LED lighting that is expensive to replace but has an average life span of 15 years or you would rather spend smaller amounts more frequently. All of the cooker hoods we have featured have in-built lighting. It is good to research how expensive the lights would be to replace, and if you would be able to do it easily yourself. Most have more than one light, as well. How Should I Fit The Cooker Hood? The majority of manufacturers recommend that you consult a qualified engineer when fitting an item that concerns electricity supply and wiring. A lot of suppliers offer an instillation service, whether free or at an extra cost, and most will remove your old product for recycling. How Loud Will The Extraction Fan Be? 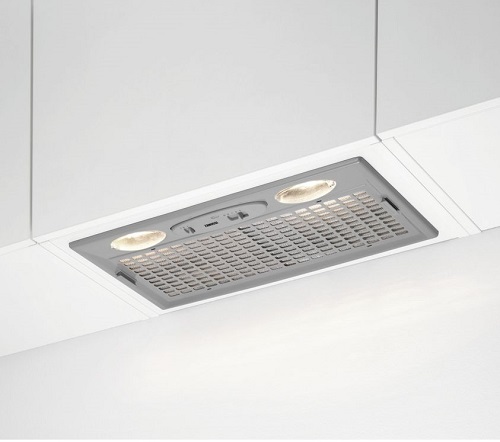 If you are after a cooker hood which will offer little disturbance sound wise, then look for a 45dB to 66dB item. If the product is large and needs to clear a large space, be prepared for it to be a bit louder as it has to work a lot harder than its smaller counterparts.